It's all so sad. We're ok because we're high on a hill, but some friends have evacuated and some have houses underwater. My best friend went back to check on her place to find the water was up over her lawn but didn't reach the house. She was lucky; her neighbours not so much, and her driveway became the boat ramp for vessels trying to get back to homes to see the damage. We had house guests for awhile as well, a hound we doggy sat so his parents could go back to their house, and a friend who was on 'The List' of places to be affected. As for Mr Fork and I, we're fine but its hard to see places that are so familiar looking so different. Its harder than words can say actually, and its horrible to think that I'll have to go to work on Monday and brave the smell of sewerage throughout the city and the sight of all that devastation. On a personal, selfish note, I have tickets to Wicked on February 5th, and I'm hoping like mad that QPAC is able to re-open. 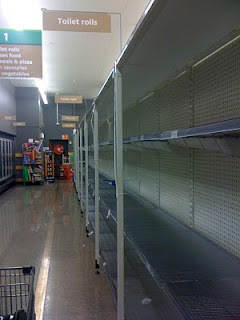 Of all things, we ran out of toilet paper, and when I went to get more, because of all the panic buying going on, the shelves were bare! I mean honestly, I expect the bread, milk, fresh produce, pasta, eggs etc... but the loo paper? Merde! !